One of the most common questions from our customers is when the perfect time to visit the Kimberleys is. While the region is fantastic all year round, and host to different, equally fantastic displays no matter when you come, visiting during the wet season can afford some unexpected benefits. You’ll be able to experience the region at its most lush and beautiful, when the waterfalls are the most splendid, and the rivers are full and coursing. If you’re in the market for flora and fauna spotting, and the sight of nature in motion, consider taking a trip early and beating the dry season rush. This wet season, the Kimberley has been experiencing record rainfall, so right now waterfalls are in full flow, wildlife is in abundance and the scenery is simply stunning. 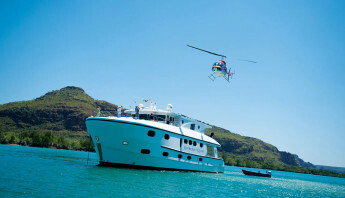 There’s never been a better time to cruise the Kimberley coastline. When is the wet season? The wet and dry seasons aren’t quite as marked as regular seasons, but they hit pretty consistently around the same time each year. 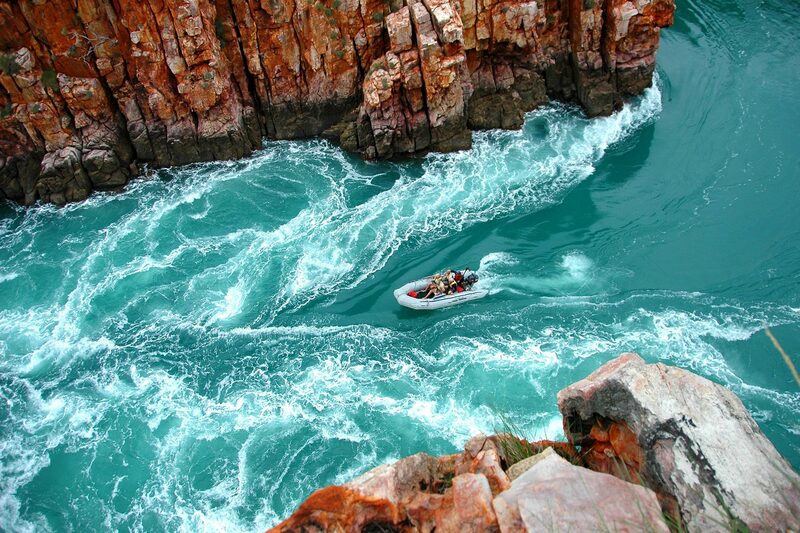 In Western Australia, the wet season lands sometime around early-mid November and runs right up until April. Why visit during the wet season? There are two main reasons to visit during this time: to experience the transformative effects of the rain upon the plains, creeks, waterfalls, and valleys of a usually dry area of Australia, and to experience the wonders of the Kimberleys without the huge influx of tourists that might otherwise throttle up the pathways. When you visit during the wet season, you’ll see a land that few get to experience. Tiny, insignificant puddles and trickling creeks become verdant, lush, and blooming ecosystems, thundering down through the dense greenery towards crashing waterfalls below. During the dry season, people often remark on how impossibly high the flood markers are compared to the water volume, which goes to show just how drastic a change can come over the land in just a few short weeks. Just remember to pack a poncho; it’s not called the wet season for nothing! The majestic waterfalls of the Kimberley may seem impressive during the drier months, but they don’t hold a candle to the majesty of the full experience. Around late November, all of that added rainfall in the Mitchell River begins to cascade down, making them double, triple, or even quadruple in size and volume, as well as creating new falls in places that don’t even get runoff during the dry months. Particularly of note here are the Mitchell and King George falls, which transform from a fantastic spectacle into a world-class photography and tourist site. These can be experienced from the air or alongside one of our cruises. One of the most popular ways to experience the wet season is from the air. This is mainly due to the chance of road closures, and the sheer scale of some of the sights that you’ll experience (especially those gigantic waterfalls!). To suit those that might like to get a feel for the sheer magnitude of the changes, the True North Expedition features an onboard Eurocopter 130 B4, which you’ll be able to take with the assistance of our pilots to any nearby place; to a secluded, green hill overlooking the sunset, an aerial escapade above the falls, or simply to get a lay of the gigantic, beautiful landscape around you. It’s not just the flora that gets a boost during the wet season. Throughout the season, the local wildlife really starts to come into its own. Fish begin their breeding rituals, which brings out the best, most mature fish right to the mouths of the estuaries and fishing spots of the region. If you’re looking to catch the big one, there’s really no better time to try. That also means that any birds or animals that prey upon the fish will be out in style. You’ll be able to catch a lot of the non-migratory birds, as well as some of the animal species, a little more off-guard than usual. Less people and more food means that everybody’s a little more brazen than normal, and more willing to come out to play. In November, you’ll be looking at a very, very warm and humid stay. The wet season is barely starting, which means you’ll be able to take advantage of comparatively lower rainfall, and no chance of road closures. However, the plants won’t quite be in full blossom yet. By December, the Kimberleys start to transform. Unless the rains are sparse, the start of the month sees green shoot out abundantly across the region, changing entire swathes from desert to paradise in less than a week. It’s hot, it’s beautiful, but a lot of the residents (and shops) will be enjoying their Christmas holidays. However, December is still one of the best times to take advantage of the new growth. Throughout January and early February, you’ll see the most rainfall, and experience an increased chance of a cyclone. Roads can be closed with little warning, but an intrepid expedition will see the Kimberley in its full majestic, green glory. Nearer to March, until the end of the season in April, the rain begins to peter out, but the green remains. You may still experience late showers, but mostly the Kimberley is getting ready for the Dry spell. This is probably the hardest time to travel through, but if you manage, you’ll be rewarded with the final moments of the Kimberley in full blossom. Obviously in the wet season you are bound to experience lots of wet weather conditions, so the main thing you can do to be prepared is to make sure all your clothing and valuables are as waterproof as they possible can be. Plenty of raincoats, waterproof shoes, and covers for your electronics are definitely necessary, to make sure you can still take some amazing photos, no matter the weather! Remember that if you’re planning to experience the wet season, you should book accordingly alongside the projected rainfall, or plan for some aerial encounters due to road closures. Luckily, our True North expedition comes fully equipped with an onboard helicopter, so that you can experience the true majesty of the Kimberleys with no obstacle.